As we complete TGA Vol. IV, No. 1, we look at how to report on all of the references that Gardner Research has used. We have started a bibliography but need a better way to discuss research issues. To date, we have also used blog posts. This post deals with two references to magazines that get some attention in the coming issue of the TGA. Last year, as we were reviewing the first five volumes of the Massachusetts Magazine (Wikipedia), we looked at the other attempts at publishing about that time, for several reasons. For one, they are a point-in-time capture of the state of things related to U.S. history. We use an example out of Dr. Frank's periodical experience, below. But, Hector St. John is an example of someone being here and then writing in Europe. He needs as much attention as Lafayette. The French loved his revolutionary-war era tales. We can put these types of things into a timeline related to the U.S., something like this: 1770 to 1840, 1840 to 1890, 1890 to 1940. The middle period would include a lot, such as the Southern Literary Messenger. For one thing, printing technology improves. Also, we have The Atlantic which still publishes having started in 1857; imagine the modern approach compared to one hundred and sixty years ago. Dr. Frank's MM would be in the last period. We will be able to present the entire TOC with the coming print of TGA volumes III and IV. We will post when the copies are ready. But, going back to the first period (1770 to 1840), we can look at part of one volume of The Massachusetts Magazine which is on-line: Massachusetts Magazine or Monthly museum. This volume is from 1794 for six months. It started printing in 1789 out of Boston. The Library Journal (Volume 14) for 1889 mentions that this periodical published until 1796. In that same time period, we had the American museum that started out of Philadelphia in 1787. The publisher was Mathew Carey (biography). This is an example issue: The American Museum or Repository of Ancient and Modern Fugitive Pieces ... It is huge involving a lot of work. And, Carey had a large subscription list, unfortunately, many of which were free (the list is categorized by State - Massachusetts is first). So, Carey had to stop publishing after five years. From the beginning, there was print activity everywhere in the U.S. So, we will see lots of examples in those defined periods. Without the modern shipping methods, most of these efforts stayed local. However, the American Museum had a nationwide (at the time) audience. The Southern Literary Messenger, with Poe as editor, started in the first of the groupings but continued well into the second. As such (with other examples), it demonstrated views held by some. Seeing these in the original context and voice helps understand issues. Again, the thematic thrust is the 400 years that went into the making of the U.S. as it is now. And, freedom of press is a crucial point. Too, juxtaposing the turmoils, including operational aspects, of those three periods with today's whizzbang methods might just provide some needed insight. Now, Frank's magazine was in the last period, but here is an example of content related to the second. 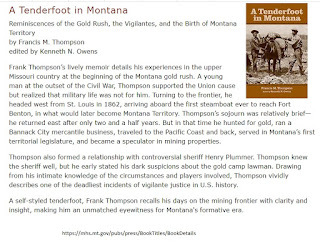 Namely, F. M. Thompson wrote of his western experience starting with his banking work in several mid-western states. This is worth looking at more closely due to his detailed report. Fortunately, F.M. was consistent in that. Montana, in 2004, picked up his articles from The Massachusetts Magazine and published them (it is noted that the material came directly from Dr. Frank's periodical). 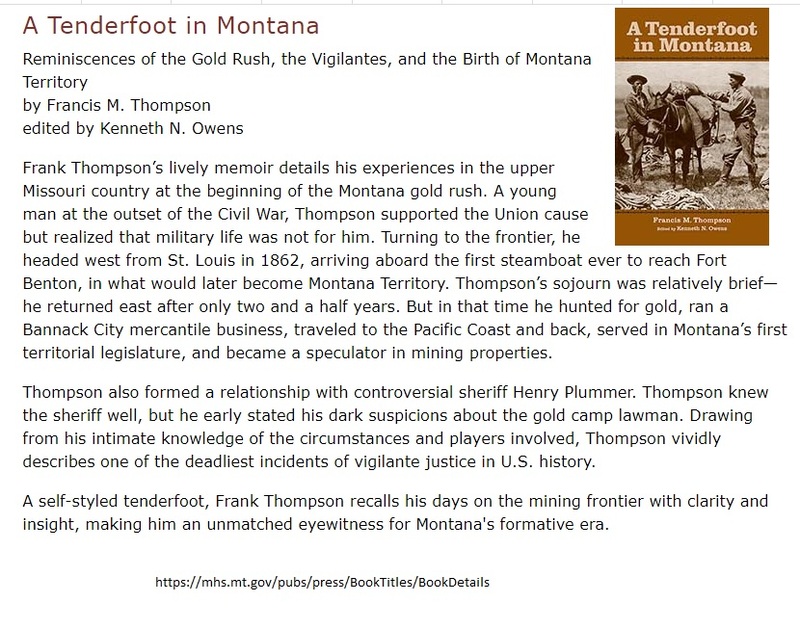 The title of the book is Tenderfoot in Montana (via Google). K.N. Owens did the editing and included some useful maps in the beginning of his introduction. We will look at that further. Some of the events that F.M. wrote about are in Wikipedia, referencing other material. However, we will get his name back in the scope of things. He helped design the Seal of the State. Also, he ran a mercantile business in a mining town of about 10,000. Bannack is now a ghost town. It is protected; there is some shindig there yearly. F.M. left to return to Massachusetts where his future bride was waiting. F.M. is quite graphic about the life in the wilds of those times. So, his writing is a gem. The early part about banking is apropos, still, to discussions that seem to reawaken every generation. In a chapter on vigilantes, F.M. describes the crime, the arguments of frontier justice, and that several men were hanged. In Massachusetts, F. M. was a judge. We will look further into that. 06/17/2018 -- In looking at the Wikipedia page on Henry Plummer, hanged by the vigilantes, there is no reference to his marriage which F.M. noted (later a judge in Massachusetts). There was no reference to F.M., at all, in the write (yes, some fiction is referenced - sign of the times), so we need to correct that oversight.